Anyone who has followed my work over the years knows of my interest in several key themes related to sound; resonance, tectonic acoustics and incidental installations. I have often treated these independently either as actual subjects or conceptual studies, but my passion lies in the possibility of fusing these together. This is the special case of one such object which has been the focus of many experiments for over a decade, an unused water tower I call the “cactus” because of its shape and surface covered by spiky metal protrusions. While the tower looks impressive as a solitary monument standing about 4 stories tall, it is its hollow volumetric character that offers possible intervention and acoustic exploration. With the steady rotation of artists visiting for Active Crossover: Mooste, the water tower became a site for revisitation, to be observed and recorded in different weather conditions and modes of interaction with each visit. What I noticed over time was how the magnetic character of the tower affected people, first with its monumental stature when seen from a distance, then how people are pulled inward upon hearing the depth of the reverberations from within. In numerous instances time seemed to stop as we gathered around, crawling about, climbing, plucking, bowing, striking, howling, stringing and generally playing in and around the great structure. In a matter of minutes the tower becomes a subject of transformation, from relic of Soviet industrial agriculture, to an acoustic temple for ritual intervention. All the while we lend our ears to the moment. 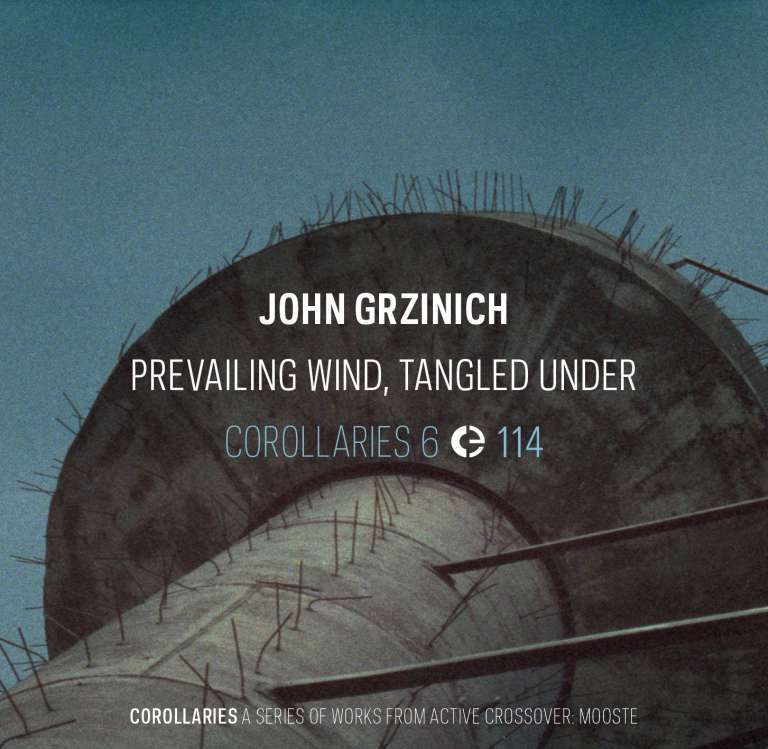 Prevailing Wind, Tangled Under brings together two independent recording sessions at the tower, carried out a month apart. The first was a dialogue of sorts between three artists carried out through sporadic sounds and the second was a solo follow-up to meditate on how the various artifacts attached in the previous months were affected by the windy conditions on a particular afternoon one day just before the solstice. Both sessions were durational in nature which I have left unbroken to give the tower the attention it deserves and to convey in part, the monumental scale in which the tower itself exists in relation to the surrounding environment. Here the reverberant character and material qualities are not merely used for effect but allow one to hear the tower live and breathe in its own element. John Grzinich has worked since the early 1990s as a freelance artist and cultural coordinator with various practices combining sound, image, site, and collaborative social structures. His primary interest is working with sound and listening, combining such divergent methods as field recording, filmmaking, electro- acoustic composition and performance. His compositions have been published on such labels as SIRR (PT), Staalplaat (NL), Edition Sonoro (UK), Mystery Sea (BE) CUT (CH), CMR (NZ), erewhon (BE), Intransitive Recordings (US), Digital Narcis (JP) Taalem (FR) Semper Florens (RU), and Cloud of Statics(CH). He lives in Estonia and works as a program coordinator for MoKS, a non-profit artist-run centre.